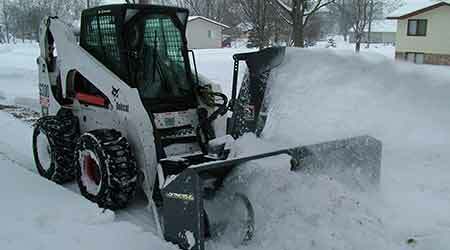 Skid steer snow blowers are offered for a wide variety of flow rates, starting as low as 15 gpm. Seven models are available in 72- to 84-inch widths. They come with a universal coupler, a single motor design and an electric spout rotator. A total of 11 rear-mount, PTO-driven tractor models are also offered with one-, two- or three-auger configurations. Available in 60- to 108-inch widths, they accommodate tractors with 540- or 1,000-RPM PTO drives and 16- to 200-PTO horsepower. The units feature two-stage designs for highly efficient operation. All components feature heavy-duty construction, including the auger, impeller, spout, gearbox and chain drive. Other standard features include adjustable skid shoes, reinforced body braces and shear bolt protection.